Social security card is an important document for any adult United States citizen. It is what you need to secure a job, collect social security benefits and get other vital government services. It is therefore very important to apply for a new social security card once you qualify. Nevertheless, many people who have attained the correct age are not aware of the application process for a new social security card. What Are The Requirements to Apply For New Social Security Card? The acceptable documents include U.S birth certificate or a valid U.S passport. NB: If the applicant is aged 12 years or above, he or she must prove that social security number was not assigned by appearing in person. · Non-driver identification issued by the state. · United States Military identification card. You notice that some of these documents overlap. The US Social Security Administration allows you to use a single document for dual purposes. In other words, you may use U.S birth certificate as proof for age and citizenship. Nevertheless, you must produce at least two different documents during your application. Once you have all the necessary documents, you can fill out and print application for social security card form available in the agency’s official website (www.ssa.gov/ssnumber/). You can download the form in PDF format and fill in the required fields using the information in the documents above. The last step involves sending the duly completed form to the local U.S SSA offices near you. You can either take it to them in person or send it via mail. It is always important to have a record of the completed application form. You can produce several copies and file them for records. 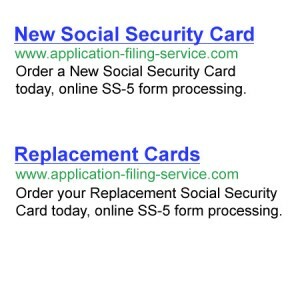 Remember you can also apply for a new social security card for a second party. In this case, you will be required to indicate the relationship between you and the person you are sending the application for. The process remains essentially the same.